Deb's Cup of Tea: Minor Crisis Upcoming. I saw that. Don't roll your eyes at me. This is serious. 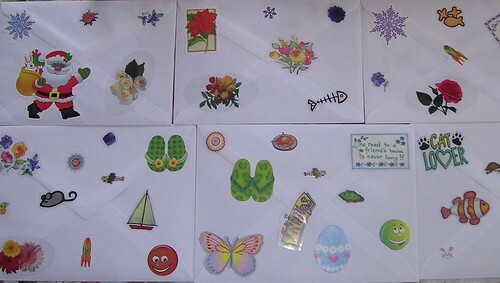 If you have ever received a letter or card from me you know my signature style is to festoon the exterior with stickers. Witness the backs of the few Christmas cards I was able to mail this year. Everyone knows the card is from me. I like to think I provide a wee bit of a smile in a day when you open your mailbox and you see this in with the catalogues and bills and solicitations from various charities. I like having a variety of stickers. 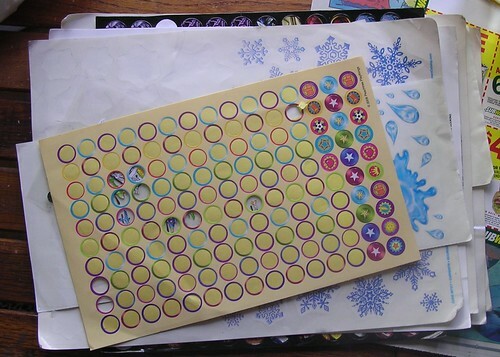 Hobby Lobby routinely puts stickers on sale 50% off and, over the years, people know to get sticker packs for me for Christmas. I'm just as thrilled to receive $10 worth of stickers as I am new socks, tea or underwear. Honestly. This financial impediment has seriously depleted my sticker stack. It's more important to get a container of peanut butter for sandwiches than it is to hit Hobby Lobby for discount stickers. Still, I feel sad because this very much is a part of who I am. On the other hand, maybe you really didn't like receiving sticker covered envelopes so my running out will be a blessing to you. I have enough, I believe, to make it through summer. Perhaps, by then, I will have righted the ship, bailed the water and be steaming toward a better horizon.